I got to test three recipes for the forthcoming revised and updated Gather Round the Amish Table due out next summer from Herald Press. The first was Ruth’s Chocolate Cake, results shared here. Today I share my second tested recipe. Traditional yeast-raised sweet rolls with frosting on top (as opposed to sticky buns, which have the gooey on the bottom and you turn them out of their baking pan upside down letting the goodness drizzle downward) were among the first things I became something of an expert baking way back in high school. I do not usually call myself an expert on anything in cooking but I baked so many sweet rolls for bake sales, for company coming, and eventually for a restaurant where I worked as a waitress one summer, that my mother even continued making them for the restaurant for awhile after I left. I used a modified recipe my home ec. teacher gave us from a magazine. 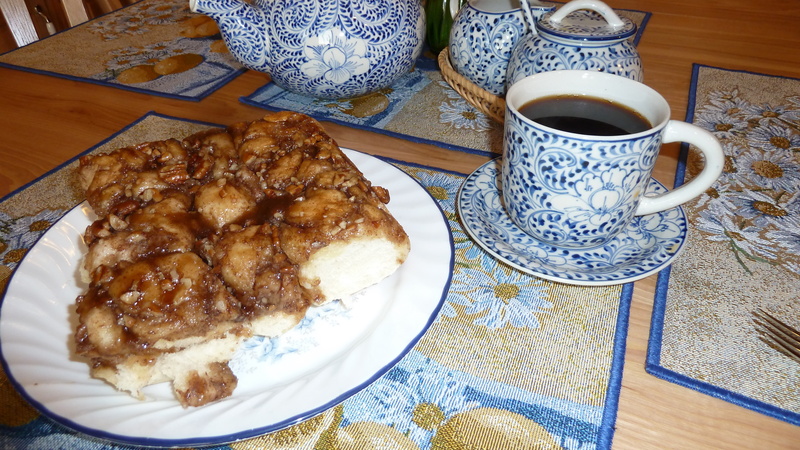 Anyway, I had sweet rolls down pat, but I had never made sticky buns. So it is not too surprising that when I tested this recipe for my employer, I almost made a huge goof. Making the dough was no sweat. Forming little buns was no sweat. I put the brown sugar, cinnamon and nuts in the bottom of the pan with the little buns. But in my diligence and (cockiness?) I FORGOT TO PUT THE BUTTER in the sticky stuff on the bottom of the pan. Right before I was ready to pop the buns in the oven, I opened microwave door for some reason (maybe to reheat my coffee?) and found the melted butter that was supposed to be mixed with the brown sugar, cinnamon and pecan mixture. Dare I just pour the melted butter down between the rolls and around the edges of the pan? I dared and they seemed to turn out just fine anyway, at least my four recipe taste testers all pronounced them delicious! So here you go, but maybe you’ll want to mix the brown sugar etc. with the butter before putting the buns on top. Here’s the recipe, with the name changed to “buns” instead of “rolls” since there is no rolling these up, and with the directions altered to the way I normally put together yeast bread pastries. Warm milk to lukewarm on medium heat, watching carefully to avoid scorching. Add butter and sugar, stir until melted. Allow to cool until a drop just feels warm on the inside of your wrist. In measuring cup, measure ½ cup warm water and dissolve both packages of yeast in water. Leave alone until yeast begins its action in the water. Put 1 cup flour in bowl; add egg and beat with fork; add milk, butter and sugar mixture. Stir. Add yeast and water mixture. Mix together. Add rest of flour gradually, until dough is soft and not sticky but not dry, and forms a round lump of dough. 1/ 2 cup chopped pecans. Spread mixture in bottom of greased 9 x 13” baking pan. Taking dough ball, pinch off round balls the size of an egg, and place in pan on top of sticky mixture. Let rise again until dough is about double in size. Bake at 350 degrees for 22-25 minutes. 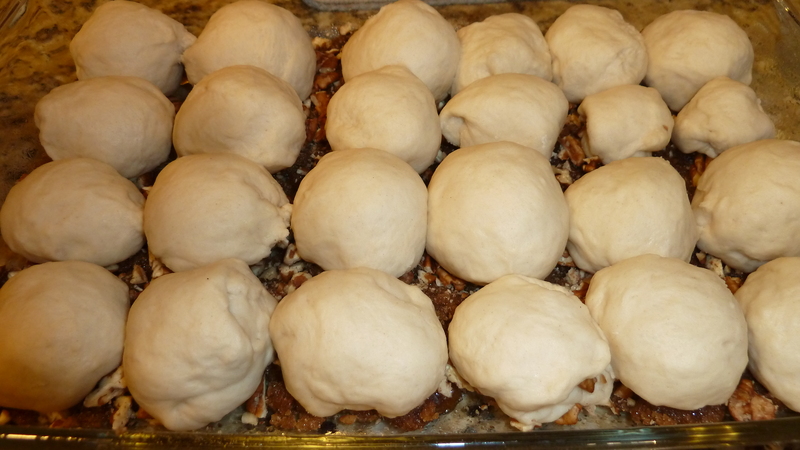 Upon removing from oven, flip onto long 9 x 13” plate or cookie sheet so that pecan/sugar/butter mixture is on top and drizzles down over buns. Makes about 18 buns. Serve warm. Can be frozen and reheated. If desired, make thin white frosting glaze for on top (these really don’t need that, but just saying). 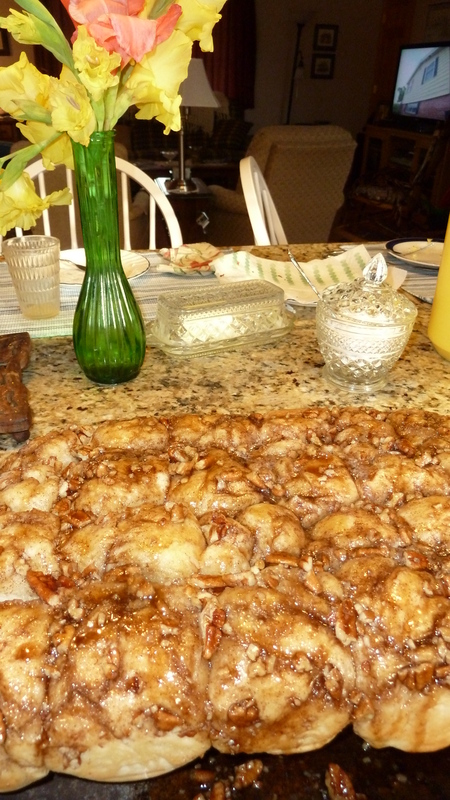 Is your family a sweet roll or sticky bun family? Or do you take the easy way out, like my easy canned biscuit sweet rolls here. And watch the Mennobytes blog for word of when the new Gather Round the Amish Table comes out next summer, with gorgeous food photography. You can sign up for that blog here so you don’t miss anything. It’s THE place to get the juicy low-down and backstories from MennoMedia and Herald Press, quicker and more chatty than the news releases and marketing blurbs announcing various new books and projects. They look delicious. 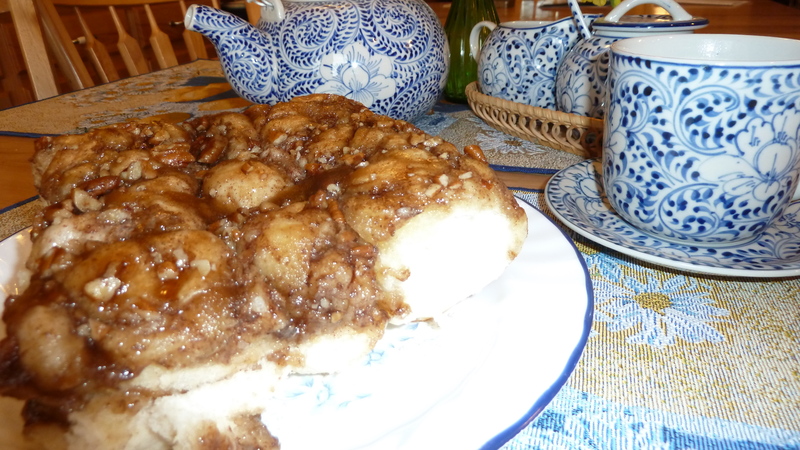 I didn’t know that is what a sticky bun was supposed to be, or is that just a variation on the sweet roll. Are they always just a ball of dough? We’ve never made them that way. Mine start out the same. I roll the dough into large rectangle, spread soft butter all over , sprinkle well with cinnamon sugar and roll up , cut into slices, put slices in pans. Bake as is for sweet roll and frost . For the (sticky) pecan rolls I melt butter in pans then sprinkle in Brown sugar, drizzle in some light corn syrup and last a layer of pecans. (No cinnamon in the sugar mix as is in the rolls) I put the slices on these, bake and then turn out onto plates while hot. Sometimes I will make a pan of each. It was my first time to make them, so I’m not sure either who calls them buns or rolls. I actually think I would like them better with the butter, cinnamon and sugar rolled into the dough. That said, they were still yummy, just plainer in the middle. Your method sounds pretty easy. We just bought an orange scone and Alaska Bear Claw at Panera’s this afternoon. I guess we are cheaters! 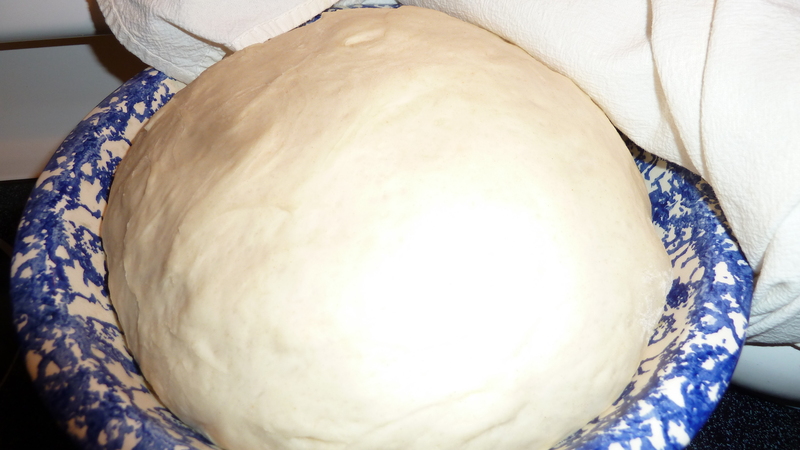 Do like the image of the pregnant dough rising, Melodie, and all the other great photos of your work in progress. Love the Alaska Bear Claw from Paneras–but not because I’ve bought a lot. They were donated to our office frequently for a couple of years, sinfully delicious. I’m secretly glad not to have that temptation nearby. Love your tagging the dough as “pregnant.” Great descriptor, English teacher! They are very easy because I just use my regular honey white bread recipe. I often make bread while cooking dinner, so if we want rolls I can make two 9″ cake pans of sweet rolls out of one loaves worth of dough. One pan will often be eaten up that night for dessert, depending on who is home and / or visiting.